The Rose Hill golf team has had a special road the last few years. Many of this year’s golfers were on the regional varsity team in 2013 as freshmen. The team took 9th out of 10 teams at the relatively weak regional tournament. The team came back as one of the strongest teams Rose Hill has ever seen in 2014. They won multiple tournaments as sophomores but had a terrible day at regionals. They took 5th place and missed the trip to State they thought was almost a certain bet. The loss did them well though as they prepared for the 2015 season. Many of the State’s top teams are in the Wichita area. Rose Hill competed and even defeated many of them. There were only two tournaments where the Rockets didn’t take home a top three finish. 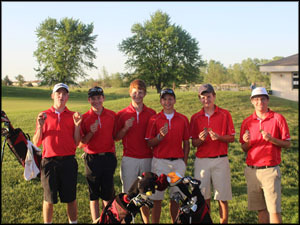 At the season opener they lost to three teams that won State this year, and Maize who lost by 14 strokes in 6A State. They also took 6th at the I-35 shootout, only losing to State champion teams, along with Maize South and Andover. The Rockets didn’t have a perfect day at State, but it was one of their best days of the year. They placed 2nd, behind Buhler who graduates half of their team after this year. They won on the 5th man at State against Wamego. Wamego will return 5 of their players as upperclassmen and one as a sophomore next year. The Rockets will return five players next year. They will have four seniors and sophomore Peyton Austin. The Rockets will have five very talented golfers next year. They are looking for someone to step up and take the 6th spot, but will most likely have to rely on five golfers next year. They will rely on each other rather than one golfer to carry the team in their final run at the State championship. It should be a tight finish next year at State with some good competition for the Rockets. They will work hard through the off season to come back as one of the best teams in the State next year. Congratulations to the Rocket’s most successful season in the programs history. After a rocky start, the boys' baseball team went on to another memorable season, finishing with yet another third place finish at State. They finished their season with a 13-3 record, after starting 3-5. What came to notice at the end of the season was the strength in the AVCTL league. Three of the final four teams at State were from the Rocket’s league. After a 3-day rain delay, the Rockets won a long 10-inning battle with Fort Scott to make it into the Semi-finals against McPherson. Unfortunately the Rockets found the other end of the stick, losing in the bottom of the 9th inning against the Bullpups. 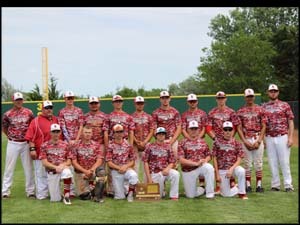 As a result of the 3-day rain delay, the Rockets had to share the 3rd place title with Augusta as KSHSAA canceled the 3rd place game. The Rockets have intentions on a deep State run again next year as they will lose zero seniors and hope to be much healthier than they were this season. The post season in baseball is always unpredictable, but the Rockets will have as good a shot as anyone at the State title next year. The Rockets will continue to be tested next year in what could be called the toughest league in 4A next year. Expect a team of upperclassmen who are hungry for the State Championship next year. The girls’ soccer team barely had enough girls for a varsity team this year, but with the help of a few leaders who stepped up, and Coach Garver, they made it into a pretty impressive season. The soccer team was locked into one the toughest 4A schedules in the State. They played many 5A and 6A powerhouse teams through the season. Near the end of the season they played comparable 4A teams and thrived. They went into the post season with a record of 7-9, but were arguably one of the top 4A teams in the State. 7 of their 9 losses came from teams who are 5A or 6A. Only one of their wins were from a team smaller than 4A. 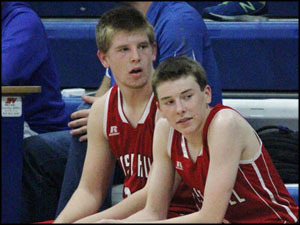 In the post season they dominated their first game against Buhler, but the score didn’t show it. They snuck by with a 2-1 win. 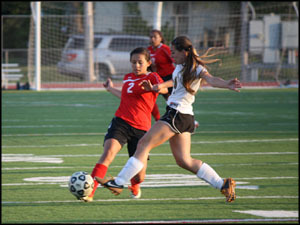 They fought hard at McPherson, but their season ended in a 1-2 loss. 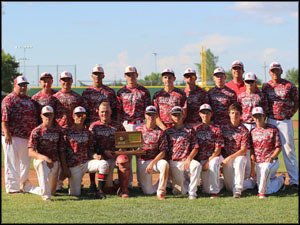 McPherson went on to be the State Runner-up, in a 0-1 loss against Topeka Hayden. The girls relied on talented seniors, but also a few new players who had to step up when needed during the varsity games. Garver was happy with the girls’ spirit and performance through the entire season. In his first year as head coach he was disappointed with the strength of their schedule, knowing they would have a solid team, but one that would have troubles hanging with the 5A and 6A top teams. Almost half of the team graduated after this season. The team will be looking for new girls to make up a roster next year. Next year will most likely have to be part of a rebuilding season. However, a new core of girls could lead to a very talented team in two or three years. Congratulations on Coach Garver’s first year as a head coach for the Rockets. This was Coach Barger’s first year as the track team head coach. At the beginning of the year he was happy with the turnout, with a large number of kids coming out. The Rockets were only returning one State qualifier from the previous year. Many Rocket athletes had to step up, and they did so very well. Eight Rockets managed to punch their ticket to State by the time regionals rolled around. A few additional Rockets missed the cut by inches or hundredths of seconds. Richard Sandefur led the track team at many of the events, including State. Peyton Brower and Brogan Collins were the two girls who made it to State, and JJ Carney, Joe Sliger, Logan Santo, Morgan Clark and Skyler Henry made it for the boys. One Relay team had a time that was good enough, but had a zone infraction at Regionals that cost them a State trip. The team had many solid finishes through the season, two coming from the Early Bird meet, and the ACVTL III league meet. Barger was pleased with how many seniors stepped up and led the team like they needed to. The Rockets will return about half of the State qualifiers next year. Expect another solid year from the Rocket track team next year. 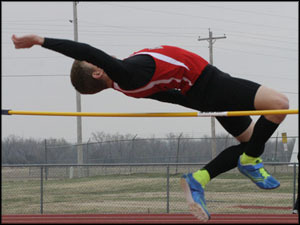 Many of the track athletes will compete in other sports for the remainder of the year, which will furthermore prepare them for next year’s track season. The girls’ softball team had many very talented girls who will go on to play in college. The team had a tough schedule, but kept their season at about .500 for the majority of it. They ended on a 1-5 slide the last six games of the regular season. Keeping that in mind, they had an impressive showing in the post season. They had to first play Circle who they had lost both games of the double header to just a week before. They won by a grueling 8-7 game in the 8th inning. They then had to play Augusta, the defending state champion, who had also dominated them less than two weeks before. The game was closer than the score showed, but unfortunately a few big innings in the middle of the game led to an Oriole win. The girls lost 4-10 to Augusta, at Augusta. The Orioles went on to win the State Championship game 7-1 against Andale. In addition, the Rockets defeated the Andale Indians in both games of the double header during the regular season. The Rockets will return a good portion of the varsity team next year. 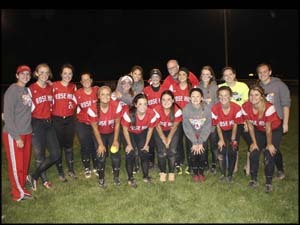 Don’t be surprised if you see the Rocket softball team at State in 2016. Congratulations to Coach Waltman and the girls on a solid season, with some impressive highlights. 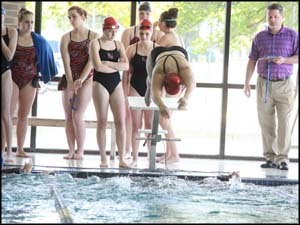 The girls’ swim team hasn’t had the best few years to start the program, but a bright future seems to await. Only twelve girls came out for the team this year, but only one was a senior, and two were juniors. Many freshmen with plenty of potential came out for the team this season. No impressive team results came this season, but some individual results started to show. A few girls managed to earn some top five finishes this year. In addition, it was the first year since the program's first year that the team did not take last at league. Two extra years of aging and practice will do nothing but help the Rocket swim team. Sally Smith has done a good job at working with new swimmers and experienced swimmers to make the team as good as it can be. All of that work should pay off in the next couple years. Be watching the girls to see how they grow as individuals and as a team the next couple years. Next year will continue to be a building year, but might be the programs best year yet. Good luck to the Rockets in their seasons to come. The boys’ baseball team should be one of the top in the state the next couple years. Last years team was made up mostly of talented sophomores and freshmen, and they managed to squeeze out some close games on the way to the State semifinal against Desoto. The Rockets came out with a 3rd place finish at State, and they bring back 7 starters from last year. The Varsity team, composed completely of sophomores and juniors, will have plenty of skill to be a great team, but will need a few leaders to step up this season and take charge. Anything can happen when Regionals rolls around, but the boys will have as good a shot as anyone to make a deep State run this year. The boys’ first matchup will be against one of 4A’s top teams, El Dorado, on March 26th. 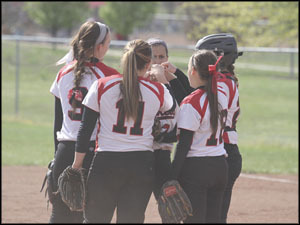 The Girls Softball team lost three seniors from a State qualifying team last year. The team ended the season 12-11, but over half of their losses came by two runs or less. The team will consist mostly of juniors, with 2/3 of the Varisty Rostr in 11th grade. Many of those juniors are returning with varsity experience from last year. The team has a positive outlook for the next couple of years. The girls will continue their disciplined training habits, and try to clean up more of the close games they missed out on last year. Expect the girls to have a good shot at making State once again this year, as one of the best programs of the past thirty years. The Ladies season will kick off on Thursday, March 26 with their double header at El Dorado. Last year’s golf team was the best in over a decade, but the season finish couldn’t had been a bigger disappointment. With only one Senior and one Junior last year, a mix of factors worked into the downfall at Regionals. The team missed State, and lost Jagger Ashby, who played four years of Varsity golf. Parker Austin’s younger brother, Peyton Austin, will most likely take the opened spot. 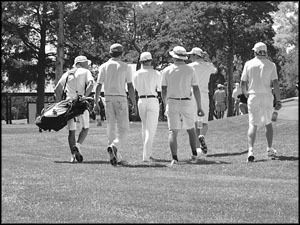 All six golfers are very comparable, and are capable of shooting mid to low 70’s. Four low 70’s have a shot at winning state on any given year. The team thought there was no way they would miss state last year, but they proved themselves wrong. The team will use this as motivation for this year. The team doesn’t necessarily have their sights set on a State title this year, but will first focus on a top two finish at Regionals this year, which will send them to the State tournament in McPherson. Anything is possible at state, but if the Rockets make it they are more than capable of a top five finish. Golf is a crazy game, and anything can happen. The Rockets will also look to win a few tournaments during the season, in preparation of Regionals. Expect a determined team that will put in hundreds of hours this season towards redeeming themselves from last years collapse at Regionals. The boys’ first meet will be at Crestview on April 6th, with many of the areas top golf programs participating. The Lady Rockets ended the season 9-8-1 last year. The girls finished with a disappointing loss to TMP in a PK shootout. The 9-8 record came from a season filled with many of 5A’s top teams, including Andover, Andover Central, Bishop Carroll, and Goddard Eisenhower. The girls will return nine girls who started varsity on last years team. The team will be built around a very solid defense, lead by Meridith Bartley. Some younger girls will need to step up and find a way to put the ball in the back of the net throughout the season. With another hard season waiting, expect the defense to help the girls grind out some close games with some very talented opponents. The girls should have a good chance at making it past Regionals this year. Coach Garver is one of the areas best coaches. He will be a critical part of the team, and he should help the team’s preparation throughout the entire season. The girl's first game will be March 26th against Goddard at 6:00 pm. Good luck to the Lady Rockets this spring. The track team had a solid season last year, with a few top three finishes at some of the smaller meets they attended. Many sophomores were among the top scorers of the team for both the girls and boys. Both teams are in similar situations. They both have a few seniors who will help lead the teams, but the Junior class will make up the core of both teams. 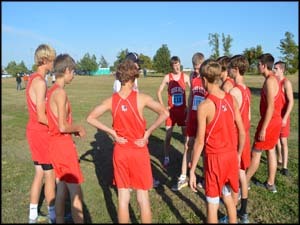 The boys will have a solid set of middle and long distance runners, many who ran cross country. Richard Sandefur will be the sole 100 M sprinter returning from last year, and had some top three finishes and could be a contender for State this year. Morgan Clark will look for some more good finishes this year in throwing events, and Logan Santo will lead the jumping events with Richard Sandefur. The top finishers from last year such as Dominique Milsap, Tiffany Jones, Emily McGehee, Haley Mermis and Brogan Collins will all look to return and lead the sprinters and middle distance. Holly Chester will be the only 3200 M runner returning, but finished in the top five at all the meets she attended last year. Peyton Brower is the lone State contender returning from last year, with her qualifying in Discus last year, and 12th place finish at state. Both boys and girls track will look to improve their finishes at Regionals from last year and send more athletes to State this year. The girls swim team had less than ten come out for the team in what is only the programs’ fourth year. Most of the girls are returning swimmers, or have swam some club before. With such small numbers, the team cannot expect to have good team scores at meets, but success is still an option. The team will look not only to grow the sport of swimming, but to stay competitive come the end of the season. With previous experience from most of the swimmers, keep your eyes open for a few individual State times this year. 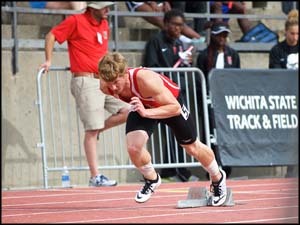 A relay or two might even find a way up to the State meet in Topeka by the end of the season. Coach Smith has a positive outlook on the season, and looks to continue to grow the new program. The Ladies’ first meet will be on Friday, April 3rd at the Heights Invitational. Good luck to each of the girl’s success this year. Any team is bound to have special athletes come by on occasion. The swim team was lucky enough to have a few very talented swimmers early in the program, somewhat of a crutch to lean on while Coach Gaskill works on making a well-rounded team. 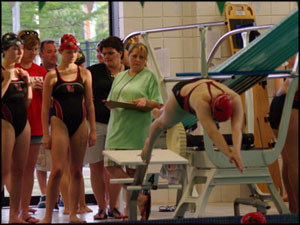 Many of the meets last year were completely reliant on five swimmers. The team lost one of those swimmers last year and now loses Brady Mounts this year. The clock will eventually run out, and Gaskill is doing his best to have a team ready when these leaders leave. The swim team made a huge leap at becoming a team rather than just being held together by a few. Toward the end of the season, other members of the team started contributing at every meet. Swimmers such as Gregory Tinkler, David Steinhelpert, Bryce Barnett and Sam Grant made an impact at the end of the season to name a few. Overall numbers of the team have grown to a decent size. Swimmers are continuing to return. The future of Rose Hill swim looks good. As for season results, the team had a disappointing finish at league; partially because of missing swimmers, and partially because of having no dive team to score points. The Rocket state swimmers, however, stepped up at State and took 4th place again. Noah Baden and Gavin Smith both took home two state championship medals. The 4th place finish was out of 5-1A teams, and Rose Hill was the top 4A team at the State meet. Congratulations to Coach Gaskill and the swim program on an excellent season and good luck in continuing the success in the future. The 7-16 record does not justify the talent on the Lady Rockets Basketball team this year. The team has a list of very talented teams on their schedule. With three starting sophomores and two juniors, it’s easy to tell the program has nowhere to go but up next year. The team was stricken with injury all year, and only had a few games at full strength all year. The girls came out strong when they needed too. Four of the girls’ seven wins came in the final five games of the season. The girls knew they had a good chance at Winfield in the first game of Sub-State. They moved on to Wellington and played excellent, pulling off the upset. 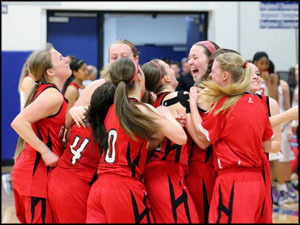 The girls got a ticket to State, and it was worth so much more than what shows on the surface. The team will have much more confidence in making State, and contending once they are in the State tournament next year. 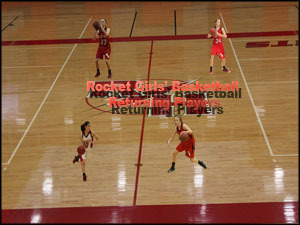 Expect the Lady Rockets to have a good season next year, followed with a possible run in State. Congratulations on the Lady Rocket’s and Coach Page’s first State appearance since 2009! Between injuries and other various reasons, the wrestling program has had a bumpy few years recently. Coach Eshelman’s return, after a seven-year absence, represented a new step for the Rockets this year. As a side note, in Eshelman’s final year as a coach, the team finished 2nd at the State Tournament. The boys’ season started stronger than it ended, but the season could still be called a success. The team was hit with multiple key injuries, especially during the 2nd half of the season. The teams’ major highlights were their dual wins against Wellington and El Dorado. They also had a very close dual with McPherson and gave up many weight classes by forfeit. The team still made do with what was left and managed to get two wrestlers to State. Ashtyn Cody and Toby Gray both went to state and won one of their matches. Rose Hill only scored a couple points as a team, but it was more about the growth of the program this year. 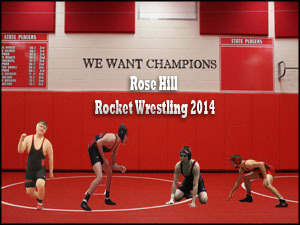 If numbers continue to stay up for the team, expect Rose Hill wrestling to become a dominant force in the upcoming years. Congratulations on the Rockets’ most dual wins in one season since the 2010-2011 season, and the turn around Coach Eshelman started this year. The boys’ basketball team had a less than prestigious season this year. Not all is lost though; the 4-18 record does not justify the hope the program has for the next years. Many starters and impactful players will return for next year. The team lost seven seniors at the conclusion of the season, but multiple players will be ready to step into big roles next year. Players like Parker Austin, Brandon Ma, and Brett Bonar all had big games this season, and will be available to return next year. This year was also filled with many close losses. Seven of the Rockets’ losses came by single digit margins. The Rockets also managed to end the season on a surprisingly good note. With the upset win against the Buhler Crusaders, the Rockets earned themselves a three seed in Sub-State. The Rockets then upset Winfield, after losing to them in two close games during the season. The Rockets’ season came to an end when they played Wellington in the championship game of the Sub-State tournament. The Rockets will continue to be a hard-working team, and expect a team that’s ready for some bigger wins next season. 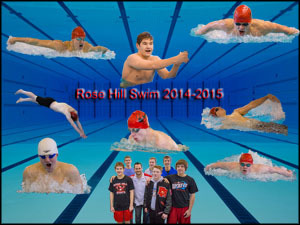 The Rose Hill boys swim team had a great season last year and show no plans of slowing down this year. The Rockets third season of the program included a 2nd place finish at league without one of their top swimmers present, Noah Baden, and a fourth place finish at the state tournament. The Rockets only graduated one state qualifier from last year and return two state champions, Gavin Smith and Noah Baden, this year. The team is looking forward to a very successful season and bring home several medals at the end of the year. The wrestling team had a rough, injury filled season last year. They finished the season 1-11 in duals with one state qualifier. New head coach Darian Eshelman returns to guide their season this year. Coach Eshelman led the Rockets to a 3rd place state finish in 2006 and a state runner-up finish in 2007 before leaving Rose Hill to guide Bishop Carroll to the 2008 state championship. The Rockets had a great turnout of over twenty-five guys this year, and will look to fill more of the weight classes at duals and tournaments this year. The results at the first El Dorado Dual Tournament will help set a mood for the entire season. There is much in the unknown for the Rockets this year in which much of will only be answered in time. The Lady Rocket basketball team went 7-14 last year, but looks to grow into a very strong team through the next two years. They will have a very young team this winter that will revolve around their speed and ability to stay competitive. The ladies will be building throughout, but expect the Rockets to keep games close through the season. Only time will tell how their season will go. Good luck to the Lady Rockets Basketball team this winter! The boys basketball team has had a rough patch the last few seasons. The Rockets finished 3-18 last year with four of those losses coming by margins of three points or less. The Rockets will win games by out hustling their opponents. The Rockets will look to grow the game this year and grind out as many close games as they can. 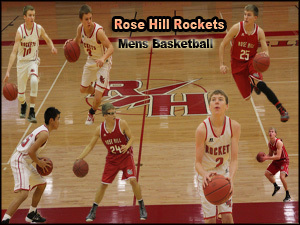 Good luck to the Rockets as they look to continue reconstructing the image of Rose Hill basketball. The Rose Hill Rocket soccer program finally got their first state championship this year with a very special team. Every starter on the team received at least league honorable mention. Brett Burns, Logan Santo, Parker Webb, Jarrod Fisher, Davin Harden and Parker Austin received honorable mention. Paker Smith and Josh Treat made 2nd team all league. Chace Beckham, Christian Helmke, Chance Beckham, Alek Santo and Geoffrey Stitcher received 1st team all league. Geoffrey Stitcher received league MVP and Jerry Treat made Coach of the year honors. The Rockets had a program best record of 20-1. The team had 13 shutouts this season, and only allowed more than one goal against them during two games all season. The Rockets won a power-packed Goddard/Campus Tournament early in the season. The Rockets dominated all season long with their only loss coming from Bishop Carroll. The Rockets defeated Bishop Carroll earlier in the season during the Goddard/Campus Tournament, and Carroll went on to place 3rd in the 5A state tournament. The Rockets had a hard road during the post-season but managed to stay alive every game. Their challenging games started in the regional championship game against Thomas-More Prep when they won 2-1. Their state quarterfinal game was against their long time rival, Trinity Academy. 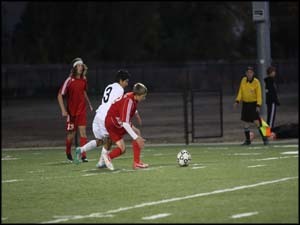 Their final home game against Trinity was another close 2-1 victory. The Rockets played their closest match of the year in the State Semifinal against De Soto. De Soto tied the game with less than two minutes to play. They went through four overtimes scoreless and went into a shootout. They made it through the first five shooters tied and five sudden death rounds before the Rockets earned their ticket to the final game. The Rockets played in a fairly uneventful final game after scoring early. There were a few good chances from both sides but the Rockets finally came out victorious. The Rockets finally won the State championship the program had came so close to so many times. The Rockets will only graduate five starters this year. Expect another state-bound season next year from the Rockets. Congratulations to the Rockets on completing the best season in the program's history. The Rose Hill Men’s Cross Country team won league for the first time in school history this year. The team had one of the best overall teams in school history also. The team had its share of ups and downs during the season. Their next biggest achievement was winning the Goddard meet during the middle of the season. David Reaves contributed to much of the Rocket’s success at many meets. The Rockets fell short at regionals finishing in 4th place, needing a 3rd place finish for their ticket to state. David Reaves was the sole rocket that qualified for state. He placed 22nd for the Rockets coming only seconds away from a top ten finish. The girls’ season was not as bright as the boys’. Holly Chester and Jessie Nutsch led the team through the season. Both came only a few spots away at regionals to a state trip. Congrats to the XC team’s first of hopefully many league titles. 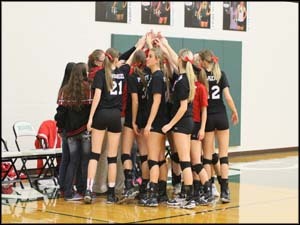 The Rocket Volleyball team had an up and down season. They had some very close loses and big wins against some of the state’s best teams. The Rockets had a fairly good season, but it was still their worst record during the regular season since 2008. The Ladies didn’t let a number slow them down during sub-state though. The Rocket made it past Augusta and Circle to make it to the state tournament for the fourth time in a row. The Ladies didn’t get the result they wanted at state, but they did upset the one seed Chanute to start their tournament. They never made it out of pool play, but the ladies were still happy with the overall result of the season. The Rocket Volleyball Program says goodbye to six talented seniors. 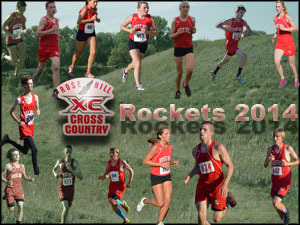 The Rockets will have six more seniors next year and plan to reload and come back just as strong for next year. Brogan Collins, Kyennedy Myers and Haley Slade were all named first team all league for the Lady Rockets. Bri Anshutz earned honorable mention for the Rockets. 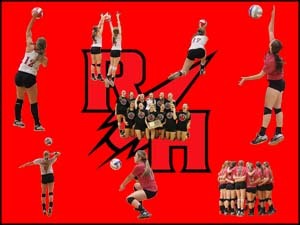 Congratulations to the Rocket Volleyball program for four great years. The Rose Hill Football program has had a rough few years since theirs state championship in 2011. They finished the season 3-6 with a few very close losses. The Rockets District game vs. Wellington came down to the final minutes and could have went either way. The Rockets also lost the second district game against Ulysses. With their losses against both Wellington and Ulysses, their chance of making the playoffs was slim but still possible. The Rockets ended their season well, beating Mulvane 28-22 but it wasn't enough in the district tiebreaker system. The other highlight of the season was beating Augusta during homecoming. The Rocket’s are going to work hard during the off-season and work towards returning to the Rocket Football tradition we all know. The soccer team may have lost five seniors who played at state last year, but there will be no recovery this season. The Rose Hill soccer program has had its fair share of disappointing ends to great seasons including the loss in the championship game last year, which was only their 2nd loss to a 4A team in their 15-4-2 season. This group of players has been playing with each other since elementary school, and knows what their teammates next move is on the field. They all know it is their year to shine. 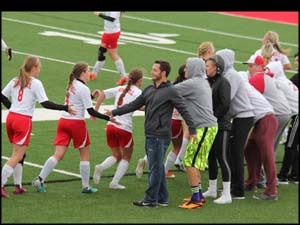 They all believe this is finally the year the Rose Hill soccer team wins the state championship match it has been pursuing for so many decades. The team has worked hard not only this summer, but for years and years putting in extra time during the offseason. With four State Runner-up finishes since 2005, the soccer team is working hard towards finally bringing home that elusive state championship in 2014. After spending much of the past decade as a state contender, including winning the 2011 state championship, the last two football seasons have been a little tough for the Rockets. Last year’s team had a tough start to the season, but ended strong with some wins and some very close losses, including their 12-14 loss to Winfield in the bi-district playoff. 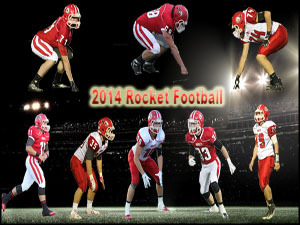 The Rocket football team will be led by captains Paco Gloria, Drew Rodman, Ray Boese, and Brody Hingst this year. Many of Rose Hill’s starters last year were young and are returning this year. Five returners this year received league honors, with two of those players receiving state honors as well. The team lost some good players due to graduation but the current group of players expect to reload and be even better. 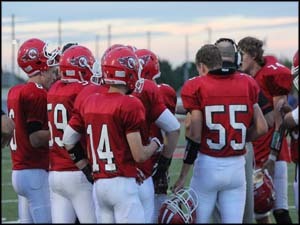 Expect the football team this year to be very close and have a bond that will give them a fighting chance in any game. The Rockets built resilience last year to never give up when down, and with more talent this year can use that resilience to compete with any team in their way. The Rocket Volleyball team has a great reputation. They have only had one losing season in the last decade, which was in 2008. As with all small team sports, most of the time you will lose most of your varsity team after every year. Last year’s team went 33-11, but five of those teams were at least a 5a school. The team will have seven players who had varsity time last year returning. The jv team had a 33-4 record last year with many of those players expected to see varsity this year. Kynnedy Myers received 1st team all metro last year and is the one returner who received honors last year, and Coach Segovia received the coach of the year award. It’s hard to tell how good other teams will be year after year, but one thing is for sure, the Rockets have big shoes to fill but they should have no problem filling them. Expect a sixth winning season in a row and a good run at state from the Lady Rockets this year. The boys’ and girls’ cross country teams are on opposite sides of the spectrum this year. The boys only lost one varsity runner from last year, but he was their top runner. Kenton Weber was a very strong part of the cross country team, but with six out of seven varsity starters returning there will be no slowing down from the boys side. The girls’ team will be young this season. They only have two returning starters, but the girls did much more than expected of them last year. They made it to state last year as an underdog, so anything is possible with the new team. Expect a good chance for a state team from the boys this year, and the girls’ outcome will be dependent on the work put in by this inexperienced new girls team.